We’d love your help. Let us know what’s wrong with this preview of Prunings by Helen Moffett. To ask other readers questions about Prunings, please sign up. A lovely book by a wonderful editor, writer, and friend. I absolutely adore poetry so when I was contacted by the author to ask if I would read and review her small collection of poems called 'Prunings' I didn't hesitate to say yes! Prunings is a collection of heart-felt poetry, brought together by the themes of travel experiences, life changing experiences and wildlife and the environment. The poems are often small and easy to digest in a couple of minutes. Like all poetry, I believe reading it aloud brings life and soul into the words. 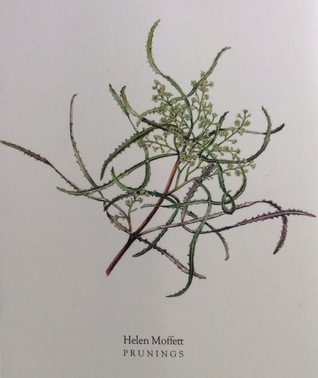 Helen really ha I absolutely adore poetry so when I was contacted by the author to ask if I would read and review her small collection of poems called 'Prunings' I didn't hesitate to say yes! The poems are often small and easy to digest in a couple of minutes. Like all poetry, I believe reading it aloud brings life and soul into the words. Helen really has poured her soul into this collection, each line is filled with gorgeously rich and memorable words. A few of my favourites are 'Therapy', 'Stars for all seasons' and 'Barbados', the latter literary takes you there with descriptive beauty of each line. The poem 'Therapy' is the one that touched my emotions more than any other, touching on mental illnes, self-confidence and the need to be free and unlinked from the stress of society even if for only a few hours mirrors my emotions and experiences.